The Radha Krishna Temple of Dallas is all set for its grand inauguration in July 2017. 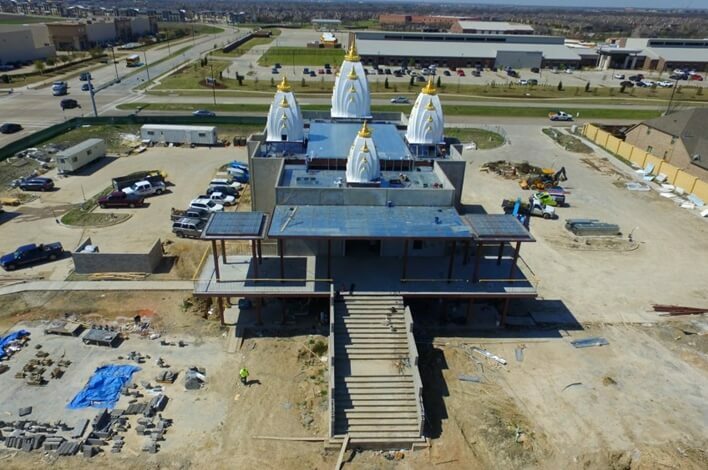 One of the culturally important Hindu temples in Texas, the Radha Krishna Temple in the Dallas Fort Worth metropolitan area will be inaugurated on July 4, the US Independence Day. As the name suggests, the magnificent temple will be consecrated to Lord Krishna and Divine Mother Shree Radha amidst spectacular ceremonies. The inauguration of the Dallas Radha Krishna Temple has a lot more in the offing, other than fireworks on the 4th of July, for devotees. The inauguration of Dallas Radha Krishna Temple is one of the most awaited Texas Indian events in July 2017, as the ceremony comprises a series of events to be held from July 4 to July 11. The 8-day celebration will commence with sanctification of the idols with a mix of holy water, milk, honey, and other ingredients. The consecration (abhishekam) of the idols will be followed by an enchanting prayer. A sacred homam will be performed in honor of the presiding deities within the temple premises as per the schedule of the Dallas Radha Krishna Temple inaugural ceremony. Offerings will be poured into the holy fire during chanting of mantras and singing of hymns for the welfare of devotees. The crown of the temple will also be sanctified with holy waters and mantras in one of the ceremonies. The schedule of the Dallas Radha Krishna Temple inaugural ceremony also includes a 12-hour akhand (nonstop) kirtan on July 11 for spiritual ecstasy of devotees from across Texas and other US states. Devotees will have a rare chance to experience spiritual awakening of the mind and the soul under the influence of Swami Mukundananda’s enlightening discourses for 8 days at the Radha Krishna Temple of Dallas, TX. Devotees can drink to the divine bliss of the Dallas Radha Krishna Temple inaugural ceremony, by singing in chorus or dancing to devotional songs while enjoying enactment of the Radha Krishna leela. Shree Kripaluji Maharaj’s videos elucidating the significance of the Radha Krishna leela will be screened within the temple premises. The Radha Krishna Temple in DFW area is not just a resplendent abode of Lord Krishna and his consort, but a haven of religious harmony, communal values and spiritual teachings. The temple has a wing of youths including Indian American teens, which works to facilitate education for the underprivileged in the Dallas Fort Worth metropolitan area. In 2016, the youth brigade of the Dallas Radha Krishna Temple undertook an initiative – Kids Assisting Kids in Education (KAKE) – to distribute free laptops with access to online educational resources to underprivileged children. Of late, the Radha Krishna Temple of Dallas launched a scholarship scheme to financially aid the children of economically disadvantaged Hindu families, who are high school seniors or undergraduate students in USA studying STEM, non-STEM, fine arts or any other discipline. Hindu students whose annual family income is below $75,000 can apply for the scholarship. The deadline to submit application forms is August 31, 2017. Read more about the Dallas Radha Krishna Temple’s eligibility criteria for scholarship. Texas Indians or Indian Americans in general can contribute to the spiritual and humanitarian missions of the Dallas Radha Krishna Temple. They can make donations to sponsor any number of bricks for the ongoing construction of the temple, maha prasad, daily pooja, certain festivities, community activities and welfare schemes for underprivileged students as well as homeless kids in the DFW area. Check the available opportunities for making donation to the temple.